The steep rock precipice known as Odo towers at the entrance of the Imatong Mountains in the heart of Sudan. Over 1000 feet of sheer faced, solid, vertical stonewall protects the villages below. Steeped in tradition and superstition, Mount Odo represents the last bastion between North and South Sudan. But in our story, the Ghost of Africa, Odo represents much more. At the foot of Mount Odo resides a small but determined community living in poverty, and appreciating all that they have. They refuse to allow man to oppress what god has declared free. Strategically located on the path between North and South Sudan along the Juba Highway, Odo towers over the region as a silent fortress refusing to allow passage to those who are not worthy. Although it may be difficult to imagine, the dark of night is complete, the quiet solitude of the mountains is something to be feared, and the peace of the region may not be disturbed by anyone, unless it is for the good of the people. These are absolutes, and they will not be ignored or abused. The region is holy and desecration carries a price. 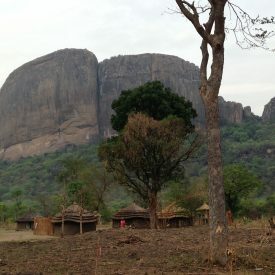 As the moon cast a faint glow on the Imatong Mountains and the sheer rock face of Odo towered above them, the Black Hawk hovered a meter from the ground in the middle of the road, bordered by trees on both sides. There were no lights—no markings—only the thumping of idling chopper blades that would be covered by the sound of a racing truck engine. At the foot of Mount Odo, our hero, Dr. Paul Branson takes a stand for good, utilizing the protection of the mountain range to insure justice—not for himself, but for others. Mount Odo is real. The beliefs in Odo are very real. The villages are dedicated, and from firsthand experience I know it to be truly awesome. This is where the chopper hovers at the skilled hands of one of the great, combat helicopter pilots of all time—hanging motionless, three feet off the ground, with trees on both sides and an immovable rock face just beyond the imposing branches. Justice takes place here not only because Odo is a physically strategic location—but because it is where justice begins for the people of the region. Reckoning enters with boldness—the standoff will succeed for the good. As we hung over the dirt roadway, eerie darkness surrounded us. The rotors of the chopper whomped a steady rhythm, waiting for the truck to breach the hill ahead. I knew at that moment, Odo is more than a sheer rock face—it is the symbol of final truth for the people living in its shadow. God will prevail here because He chooses to do so. Dr. Paul Branson is just one part of the story.